24370 Private William Hutchfield, 2nd Battalion, Duke of Wellington’s (West Riding Regiment) was killed in action 12 April 1917. He is buried at Brown’s Copse Cemetery, Roeux  and commemorated on the St. Helen’s Colliery Memorial Cottages and the West Auckland War Memorial. He was about 29 years old, married to Violet with 2 children. All children were born at Coundon except Sarah and Liza who were born at St. Helen Auckland. By 1911, 22 year old William was living with his parents at Front Street, St. Helen’s Auckland. Both his father Owen and William worked as coal miners (hewers). William married Violet Robinson at Auckland Registry Office 28 October 1912 and they had 2 children, James born 12 August 1912 and William born 7 May 1916. They lived at the Barracks, St. Helen’s Auckland. 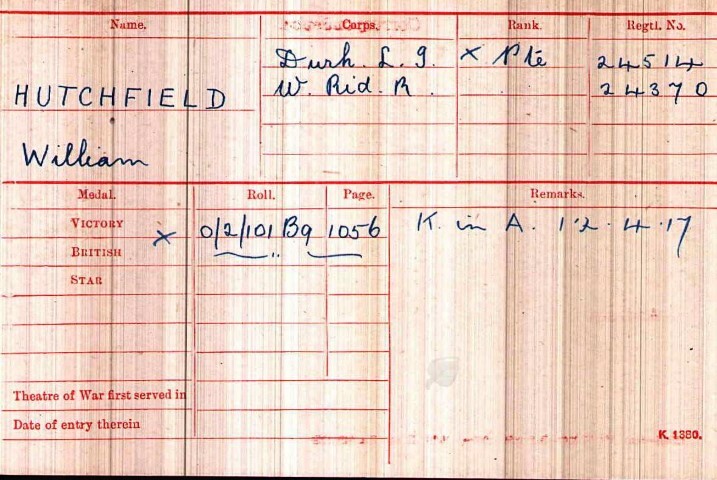 William Hutchfield attested 11 March 1915 aged 27. He was 5ft.5” and weighed 122lbs. He enlisted into the 17th battalion, Durham Light Infantry, given the regimental number 24514 and was transferred to the 2nd Battalion, Duke of Wellington’s (West Riding Regiment) 31 October 1916 being given the regimental number 24370. Private W. Hutchfield served a total of 2 years 33 days, 1 year 5 days at home and 1 year 28 days abroad. Private W. Hutchfield served with the 2/West Riding Regiment as part of the 4th Division, 17th Corps of the Third Army when the First Battle of the Scarpe, a phase of the Battle of Arras, commenced 9 April. It concluded 14 April 1917. The Battalion War Diary has not been researched. 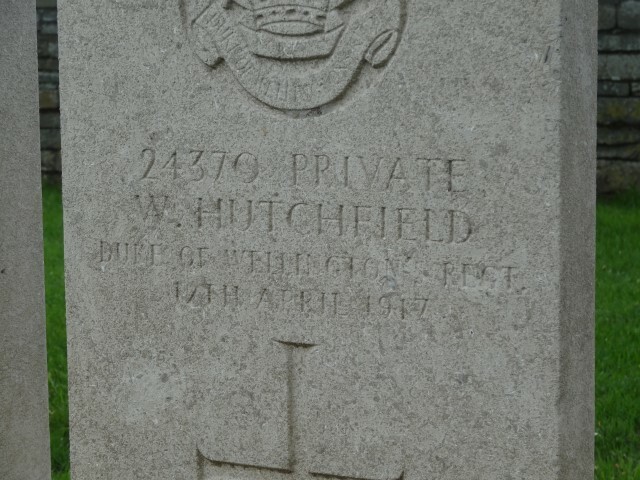 Private William Hutchfield is buried at grave reference III.A.27, Brown’s Copse Cemetery, Roeux.